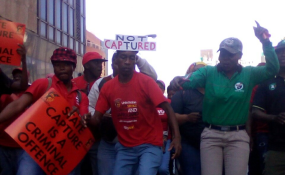 Workers protesting against state capture, job losses and corruption (file photo). The Judicial Commission of Inquiry into Allegations of State Capture is scheduled to begin on Monday and many key witnesses expected to testify. The inquiry is being held in Parktown, Johannesburg where Ndleleni Willie Mathebula, a seasoned treasury staffer of 15 years, former deputy finance minister Mcebisi Jonas, former ANC MP and parliamentary caucus chairperson Mabel Petronella Mentor, former Business Leadership South Africa (BLSA) director of communications Themba Maseko and government communications Deputy Director-General Phumla Williams are expected to be called to testify. Deputy Chief Justice Raymond Zondo said the duration of the hearings would be guided by evidence led. He previously said he was concerned that not enough people were coming forward with information that could assist the inquiry. He added that members of the public with relevant information should come forward. Zondo previously welcomed a decision by the North Gauteng High Court in Pretoria, which granted his request for an order to extend the inquiry for a further two years. He had launched an urgent application on July 19, asking for an order extending the 180 days within which the commission is required to complete its work. The period of 180 days was included in the remedial action of the State of Capture report released by former Public Protector Thuli Madonsela in October 2016. The High Court in Pretoria granted an order calling upon various persons, including the president and the Public Protector, to show cause as to why the period of 180 days should not be extended by 24 months, calculated from March 1.